The holidays have arrived! Union Station’s annual tree lighting ceremony will take place on Thursday, Nov. 29. Festivities begin at 6:30 p.m. on the south patio. Come enjoy the lights and a free performance from the Grand Arts Chamber Singers and The Los Angeles Symphonic Winds. The festive, family-friendly holiday celebration will transform the station into a winter wonderland featuring a towering white Christmas tree, a “Cocoa Bar” with Elftenders, a Holiday Craft Zone for gingerbread house and ornament decoration, a Kids Zone with a Reindeer Toss and more! The famed Confetti Project will make an appearance with an immersive pop-up studio offering guests an opportunity to celebrate the season with their own personal photo session. The tree lighting is scheduled to take place at 7:15 p.m. 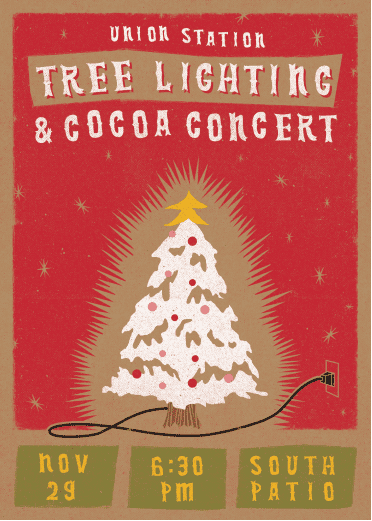 The event kicks off a month-long series of free “Cocoa Concerts” at the historic downtown destination throughout the holiday season. Dates for the concert series are: Thursday, Nov. 29, and Fridays, Dec. 7, 14, and 21. Union Station will also host a holiday festival and pop-up artisan market on Saturday, Dec. 1 from 11 a.m. to 6 p.m. Swing by the south patio for live entertainment, free activities for kids, food trucks and marketplace!